Manufacturer of a wide range of products which include lever hoist, ratchet lever hoist and mini electric hoist. We are established suppliers and exporters of a wide gamut of material handling and lifting equipments including Lever Hoist. It is extensively used for carrying heavy loads in different industries apart from construction applications. It is fabricated by using the finest grades of metal alloys and surface coated for better and lasting finish. It has optimum load bearing capacity and is available at reasonable rates for our patrons. Assisted by a qualified workforce and advanced manufacturing unit, we are engaged in offering a wide range of Ratchet Lever Hoist. 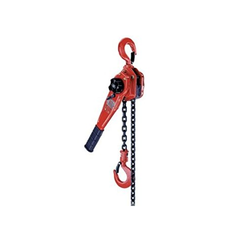 This lever hoist is made of utilizing 318 and 304 stainless steel and iron alloy. At our research and development unit, this lever hoist is made of using sophisticated technology that assists in providing extra strength and consistency to the lever hoist. 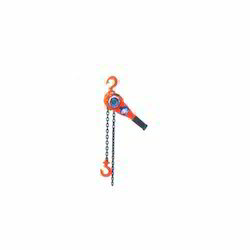 Heavy duty cranes require such lever hoist for picking, loading and adjusting a variety of containers, concrete blocks and iron spat. Clients find the lever hoist dimensionally accurate and aligned when used for heavy operations. We feel glad to introduce ourselves as one of the prominent entity of Mini Electric Hoist. Heavy duty cranes need such electric hoist for picking, loading and adjusting a variety of containers, concrete blocks and iron spat. At our unit, this electric hoist is urbanized advanced technology that helps in providing extra strength and loyalty to the electric hoist. 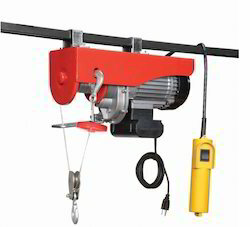 This electric hoist is made of using 304 and 312 stainless steel and iron alloy. Clients find the gear electric hoist dimensionally precise and allied when used for heavy operations.